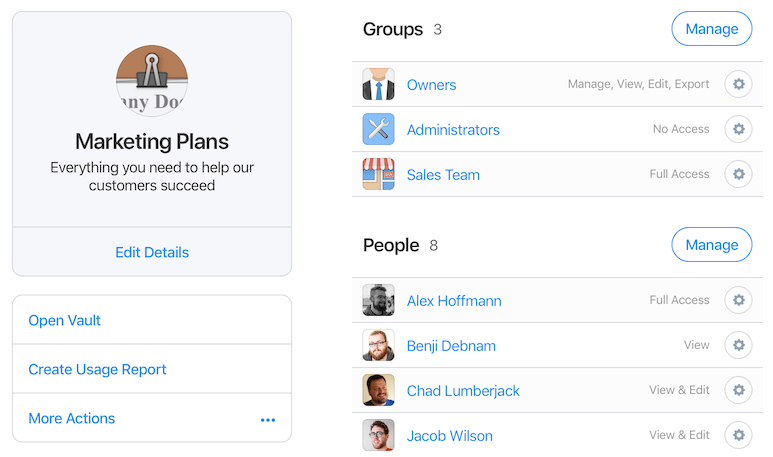 Learn how to use the sidebar to organize items, check for security issues, share vaults, and more. 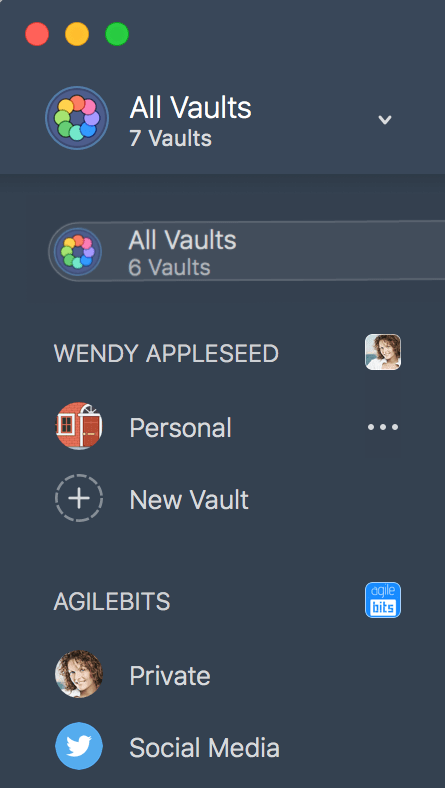 In 1Password 7, you can use the sidebar to quickly manage your items and vaults. Everything you need is at your fingertips from the moment you unlock the app. To see everything in the current vault, click All Items. To quickly access your favorite items, click Favorites. Learn how to mark items as favorites. To see only certain types of items, click a category. To see items with a specific tag, click it. You can drag an item onto a tag to tag it. Learn more about organizing your items with tags. To collapse the sidebar, click or press Option-Command-L.
To show or hide your vaults, click All Vaults at the top of the sidebar or choose View > Show/Hide Vaults (Command-L). If you have a different vault selected, you’ll see its name instead of All Vaults. Your vaults are sorted by location: 1Password accounts, Dropbox, iCloud, and vaults that are only on your Mac. To see items in all your vaults, click All Vaults in the vault list. To see items in a specific vault, click the vault name. To see items in a specific vault and hide the vault list, double-click a vault. To create a vault, click New Vault. To edit a vault, click next to it and choose Edit Vault. To exclude a vault from All Vaults, click next to it and choose Exclude from All Vaults. Learn more about All Vaults. Use drag and drop to move items between vaults and create new ones. To move items, drag them to a vault. To copy items, hold the Option key while dragging. To manage who has access to a vault, click next to it and choose Manage Access. 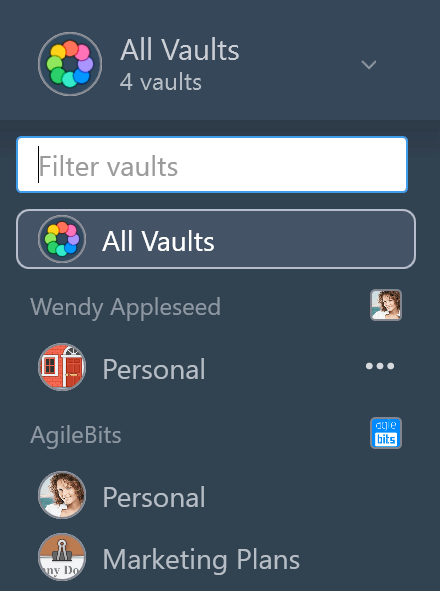 Select or deselect the people you want to share the vault with. To mark the vault as safe for travel, click and choose Safe for Travel. Learn more about Travel Mode. To see items with a specific tag, click it. Learn more about organizing your items with tags. To find passwords you need to change, click a section in Security. Learn more about Watchtower. To show or hide your vaults, click All Vaults at the top of the sidebar or choose View > Show/Hide Vaults (Ctrl + D). If you have a different vault selected, you’ll see its name instead of All Vaults. Your vaults are sorted by location: 1Password accounts and vaults on your PC. To quickly find a vault, enter its name in the “Filter vaults” field. To exclude a vault from All Vaults, click next to it and turn off Show in All Vaults. Learn more about All Vaults. To manage a vault, click next to it and choose Manage. Learn more about Travel Mode. 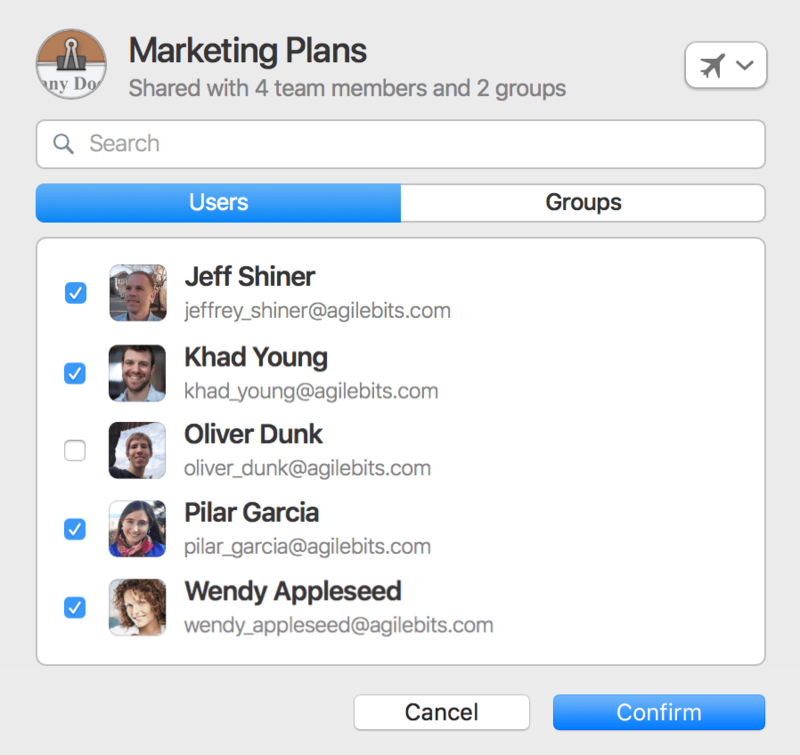 A 1Password membership is required to create new vaults in the sidebar, share vaults, and use Travel Mode. If you can’t move items, or share or manage vaults, ask your family organizer or team administrator if you have the right permissions.